“Some day in the not too distant future you’ll be able to go to a movie and the movie will be all around you. Fulldome is an extraordinary medium which is particularly suitable for conveying valuable, educational and entertaining content. With the innovative 180-degree projection system, the content and images have a far stronger impact on the audience compared with a flat screen. The audience is effectively placed in the middle of what is going on, enjoying an unparalleled audio-visual and emotional experience which leaves a deep impression on them. To further intensify the feeling of diving into the scenes and becoming part of it, the fulldome film was also produced in omnidirectional stereoscopic fulldome 3D. Omnidirectional means the stereoscopic 3D effect can be experienced on any spot around the dome, all around the audience – the viewer becomes part of the action. In order to realize this high-end fulldome 3D effect, we developed and programmed software and optimized production processes. Immersive images need immersive sound, that’s why we created the revolution in sound. In cooperation with Dolby and Arri Media we produced the first DOLBY ATMO Surround Mix for a Fulldome Movie. 360 ° videos offer a perfect all around view . 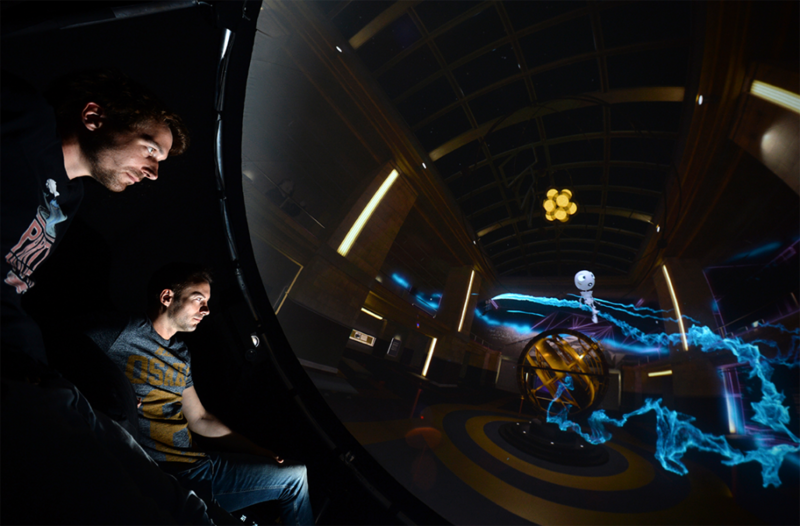 The audience is able to look in all directions within the movie either by scrolling with the mouse on screen or by using virtual reality goggles. The latter produces the effect of the feeling to be really in the middle of the scene . For the film ” Gravity” a 360 ° trailer has already been produced and in brief we also will provide episodes of the movie as content for VR goggles. The year 2015 marked the 100th anniversary of the release of Albert Einstein’s general theory of relativity (GTR). Ten years after revolutionizing our comprehension of light in the special theory of relativity, Einstein did the same for the force of gravitation. While overturning our understanding of gravity, he also changed our view of the nature of space and time itself. Probed to its most subtle predictions and confirmed countless of times, the GTR remains a theory of unsurpassed accuracy and elegance. It reinforced Einstein’s status as a superstar of modern science and made him the epitome of a genius. Ironically, it is this standing as a prodigy that leads to reservations about engagement with the GTR in the greater public. People ask themselves, quite understandably, how could they could ever fathom a genius’ masterpiece?